Summary: Antony and Cleopatra. Helen of Troy and Paris. Romeo and Juliet. And now… Henry and Flora. Set in Seattle in 1937, just as the United States is beginning to recover from the Great Depression, the novel follows Flora and Henry as they begin, unwittingly, to play Love & Death’s game. The game that Love & Death have created, so to speak, is more of a bet of trying to put two people from different worlds together. If the lovers chose to be together, Love wins; if not, Death takes them. Unfortunately, Death is on a serious winning streak and Love is hoping that Henry will be the player to finally give him the win. And here’s the thing that Brockenbrough does so well. Readers of romance expect the “happy ever after”, but the way Brockenbrough crafts the obstacles Henry and Flora face, I wasn’t really sure the “HEA” was going to happen. I wanted to be comfortable in my assurance of the HEA, and that all would work out well for Henry and Flora, but Death is a mean, err a very strategic, player and I was kept guessing the entire way. 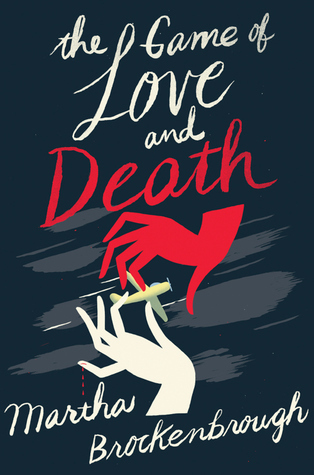 I like an unpredictable novel and “Game of Love and Death” is definitely not predictable. Brockenbrough really puts Henry and Flora through the wringer, that tests their resolve to even attempt to form a relationship. While their attraction to each other is definitely swoon worthy, their budding friendship brings a much richer, much warmer feeling to the story. It is the development of the 4 characters that is really the strength of the novel. Love is a charming old soul, while Death is a woman who finds no more pleasure in her job, but does it anyways. Henry is the boy who is willing to sacrifice his own personal freedom in order to please his adoptive parents, and Flora is a young woman who intends to defy the odds. Combined, the relationships the characters create among each other (yes Love & Death interact with Henry & Flora in unique ways) allows each of the characters to learn and grow from each other. While Love & Death are the ones who set the game in motion, both are changed by their players as their players are changed by the game. All four are truly relatable, and you root for all four to win, which in a game where two could potentially die, is a testament to the strength of Brockenbrough’s writing. Speaking of Brockenbrough’s writing, it is just gorgeous. It is clear that she did her homework with researching the novel and what 1937 Seattle would feel like. Having been to Seattle a number of times, I could picture many of the places in my head, but imagine them as they were 80 years ago. She used slang of the time and even included real world events (such as the growing tension in Europe) to fully ground the novel. She also didn’t hesitate to include the racial tension that existed in Seattle back then, even though Seattle was a multi-cultural city during the Depression. Brockenbrough’s world felt real, felt right, and I loved it. Recommendation: I got the book from the library, but I loved it so much that I intend on buying it and you should too.